Non Stop Air from Los Angeles to Papeete. Upon arrival, allow a St. Regis Butler to arrange coffee or tea service in your room. Complimentary Fish feeding and Shark feeding with the Resort’s biologist on scheduled days. Complimentary shuttle to Bora Bora Mainland during the day. – A bottle of Champagne with the Pastry Chef’s sweet treat of the day in the . **Minimum 5 nights or more also receive 50min Couples Massage – One complimentary Tropical Flower Turndown during stay. St Regis Bora Bora has some of the biggest overwater bungalows facing the pristine lagoon waters viewing Mt. Otemanu. Their bungalow are well separated from each other to enjoy your privacy. They also are the only resorts that take you to mainland with no charge during the day. 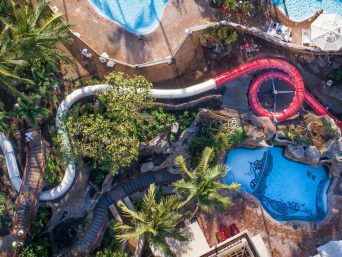 The resort features an adults-only pool with a swim-up bar and private cabanas, a kids’ club, three restaurants, tennis courts, and a private helicopter landing pad. 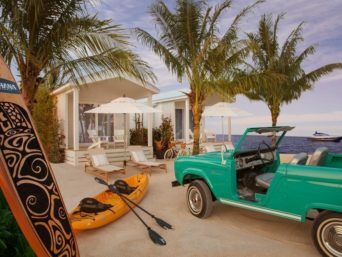 With three pristine beaches, two swimming pools and a lovely Lagoonarium filled with tropical fish and other sea creatures, and don’t froget their famous St. Regis Butler Service. 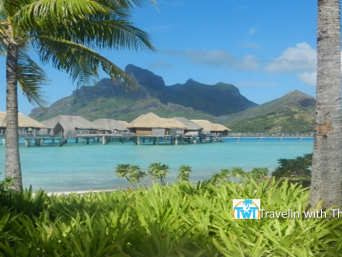 The resort offers scheduled boat service to Vaitape, the main town of Bora Bora. St Regis signature restaurant, an unparalleled French- and Asian-infused menu has been handcrafted by the celebrated Jean-Georges Vongerichten. Lagoon offers the freshest fish and ingredients indigenous to the islands with a stunning backdrop of the mythic Mount Otemanu and crystal-clear waters.. The region’s first sushi restaurant and sake bar. With a team of passionate, creative chefs, Sushi Take makes a seamless connection between the philosophies of contemporary Japan and the pure flavors of premium seafood ingredients, leaving an impression of the true art of sushi. The authentic Polynesian-inspired Te Pahu boasts beachside dining for meals throughout the day. The poolside Aparima Bar invites guests to cool down at a ten-seat swim-up bar. Enjoy a large selection of refreshing drinks, meals, and light snacks while soaking up the warm Polynesian sun. Please do not hesitate to inform the resort of allergies and dietary concerns prior to arrival. With direct access to the powdery sands and turquoise blue waters of the beach, Pool Beach One Bedroom Villa offers gracious separate living rooms, a private outdoor garden with exclusive shower and Plunge Pool. Located on the beach surrounded by palm trees, they have the same indoor configuration as the Overwater Villas. The bathroom opens onto a walled garden with outdoor shower. 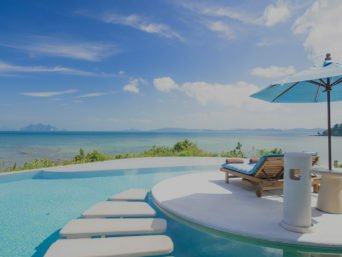 A large terrace with a gazebo and a plunge pool looking the beautiful lagoon of Bora Bora complete this elegant villa. This category is perfect for couples with young children. From the private plunge pool to the outdoor garden, to the exclusive shower and pontoon area. Facing the lagoon and the resort’s main beach, tastefully designed in exotic woods and marble; and feature a private terrace and gazebo. Further along the pontoon from our Main Beach and Common Area, are our Superior Over Water One Bedroom Villas. These 1,550 square foot islands of tranquility are soothingly and stylishly designed with private terrace and gazebo, and offer even more seclusion. 24 villas are available in this category. Facing the main island of Bora Bora and at 1,550 square feet, our Deluxe Overwater One Bedroom Villas are the largest fleet in the Pacific. Tastefully designed in exotic woods and marble; and featuring a private terrace and gazebo—they easily translate to islands of tranquility. Thirty-two villas are available in this category. 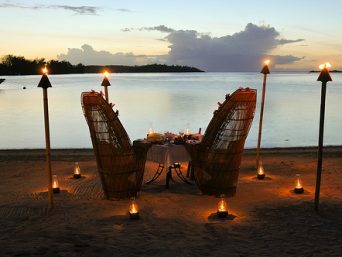 Daily 3 Course Dinner included redeemable at any of the Resort’s Restaurants subject to availability and opening hours. Polynesian Evening included. 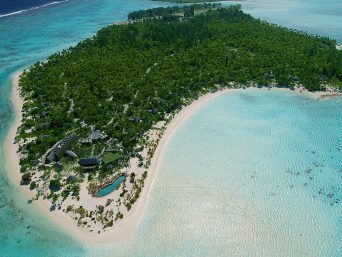 Every Overwater Deluxe Otemanu Villa at The St. Regis Bora Bora Resort is an oasis of calm beauty, looking out across the celebrated turquoise lagoon at the main island of Bora Bora and the majestic Mount Otemanu. Usually located at the far reaches of the overwater pontoons, each of the 15 villas offers 1,550 square feet (144 square meters) of tropical elegance and secluded privacy with interiors tastefully designed with noble exotic woods. These overwater villas with a stunning view accommodate up to three people. Ideally designed for a romantic splurge or perfectly suited for a family getaway, eight villas 1,905 square feet private playground and sleeps four people. Head outside onto the large terrace, where a square whirlpool just right for two awaits. Slip in and gaze out at the sunset over Mount Otemanu for the perfect ending to a day spent relaxing in a true tropical paradise. Features a covered dining gazebo, a smaller private terrace off the bedroom and easy access into the crystal-clear lagoon water from a private pontoon, complete with outdoor shower. Strategically built around its own private pool on the edge of the lagoon, our Royal Overwater Two Bedroom Pool Villas offers two bedrooms, two full bathrooms and two private terrace gazebos. Private infinity-edge swimming pool suspended over the Bora Bora lagoon is only the beginning of the wonderful things this extraordinary Overwater Royal Otemanu. Access into the lagoon comes off the front terrace, so taking a swim in the azure waters is as easy as climbing down a ladder. Meanwhile, the 4-foot (1.30-meter) deep swimming pool – the largest suspended pool over the Bora Bora lagoon in the South Pacific at 20 feet by 16 feet (6 meter by 4 meter) – is always at the ready for a refreshing dip as well. 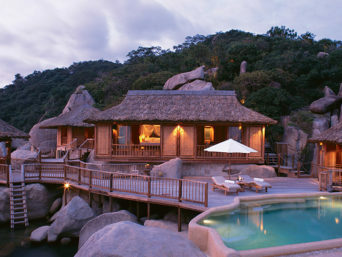 Distinct in every detail, the Royal Estate is comprised of three separate pavilions that revolve around a private pool. It boasts three beautifully appointed bedrooms, two luxurious living rooms, a chef’s kitchen, and dining room with sunset terrace. This suite also features a private spa area with treatment room, sauna, hammam and whirlpool. Magnificent tropical gardens border its private white sand beach.. Enjoy a romantic stay in paradise with our Couples Retreat Package. Children age 7-12 receive 50% discount off all regular/adult menus and children age 6 and under eat free. Access to Complimentary Kids Club open daily from 9a – 5p for children 5 years and older subject to reservations made at least 24hrs in advance. Baby sitting charges apply outside of Kids Club opening hours. BONUS: Guests staying 5 nights or more also receive complimentary laundry service for kids clothes only during whole stay Valid for couples traveling with one or more Kids Not combinable with Honeymoon or Anniversary amenities. The St. Regis Bora Bora Resort is proud to entertain its littlest guests with an array of fun-filled activities. Your child’s vacation will start with a personalized in-room greeting. A secluded beach and an indoor play area are among the resort’s stunning dedicated facilities for our kids. From discovering the surrounding nature to learning about local Polynesian craftsmanship, kids will be overjoyed by the diverse indoor and outdoor activities. All children between 5 – 12 years of age are welcome to join us in exciting adventures on the resort’s private island. Cribs and child-sized bathrobes are available in your guest room for added convenience. Restaurants are accommodating as well, with high chairs and dishes specially prepared by our chefs to fit every child’s mood. A selection of children-friendly movies and in-room toys are at your disposal by simply calling your St. Regis Butler. With 24 hour’s notice, we can arrange reliable babysitting services for your little onesPlease note that a fee applies to babysitting, and that this service is available only for children one year old and over. For more information, please contact the Concierge. With three pristine beaches, two swimming pools and a lovely Lagoonarium filled with tropical fish and other sea creatures, The St. Regis Bora Bora Resort is an aquatic playground to swim, splash or soak in with abandon. Complimentary watersports at the Main Beach include stand-up paddleboarding (SUP) and kayaking. Towels, sunscreen and snorkeling equipment (to borrow for your entire stay) are supplied at the Beach House. the Oasis Pool Featuring a waterfall aligned with Mt. Otemanu, its individual cabanas present a peaceful hideaway for a romantic afternoon. Each cabana is equipped with phones and WiFi access. No reservations required. A state-of-the-art Fitness Center fully equipped by Technogym is open 24 hours, located next to the tennis court. The Aficionado Lounge next to Reception is a tranquil space for a break with complimentary tea and coffee, a library, billiards table and television. Complimentary computer access is provided at the Business Center, while complimentary Wi-Fi access is available in the entire Resort. 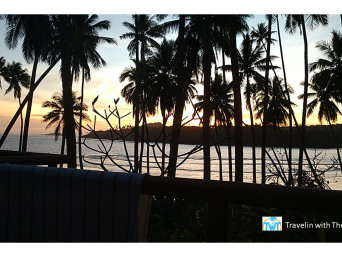 The Resort extends a once a day complimentary shuttle service to the main island and the village of Vaitape. Reservations with the Concierge Desk are recommended. Additional shuttles to the main island are available subject to a charge – conditions apply.